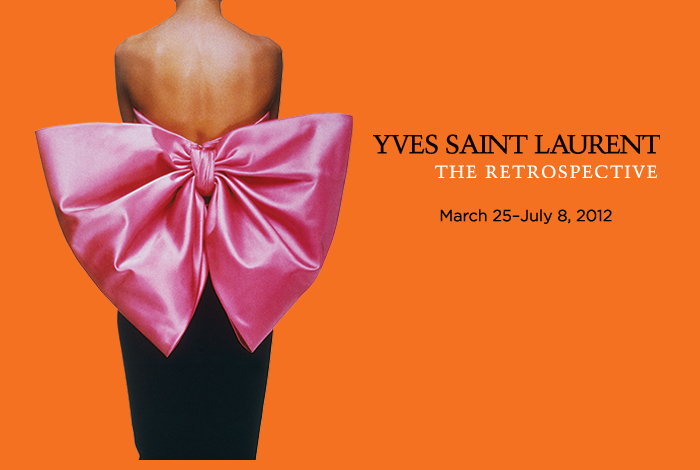 Yoohoo, all fashionistas…The 40 Year Retrospective of Yves Saint Laurent’s exquisite works are still in Denver, don’t miss it. You have until July 8th. Yes, it’s definitely kudos for Denver and its selection as one of the premier stops on this 3-city exhibition that has traveled to Madrid, Paris and Denver. Rarely does one get to see the up-close and personal handiwork that Yves Saint Laurent incorporated into his classic and renaissance-esque fashions. You will swill over the tuxedo wall. He designed the first formal suit for women. How did we survive before Yves, I ask? Most admirers of his couture designs have viewed them only in Neimans, Saks, books or vintage magazine fashion shoots. It really is a must see for any one who can get to Denver. My advice ride, drive, fly, however you can get here. Honestly, no excuse for Denverites. It is a rare glimpse of fine art from the creative mind of a skillful thoughtful artist seen through his timeless designs. This is a body of work that has put Denver on the map and it is an honor for all Colorado. Sculptor, Jim Foster sent this site to me. As a working artist for the last 40 years, Foster is about to launch a publicity campaign and blog, proving it is never too late to get into the international game of art. Creative Capital appears to be an important link for artists searching for grant money, public projects and of course, learning the biz of art and art marketing. If you’re an artist who takes, or plans to take, an active role in growing your business please go through the entire website. It lists upcoming projects, classes in promotion, installations, and techniques. As far as I can tell, it is attempting to provide an important service to the industry. I’ll be watching this site and posting pertinent information as an opportunity for Colorado artists to get a leg up on public and federally funded projects and commissions. Take a look at Creative Capital and save the link. Any feedback from you is much appreciated. If your children haven’t been to the Buell Theatre at the DCPA, this is one show you can take a chance on. The children in the audience loved the whacky, eccentric characters, the weird sets and costumes. It’s a family show that moves fast with laughter, toe-tapping energy. The reviews for the Broadway show were less than glowing, but it is what it is – a engaging musical with dance, song and creative costumes, accompanied by a silly storyline that teaches humility and acceptance to differences and change. It was delightful. Children of all ages laughed it up and seemed to thoroughly enjoy the evening’s dark and dead characters. Champagne & Chocolate will get most people in the door of any gallery on any night, any where, but why does it taste a little sweeter and richer in Cherry Creek North? It just seems to – maybe it’s the Rodeo Drive ambiance and luxurious shops mingled with beautiful passers-by and visitors observing tony art in glamourous digs in CCN. The opening of the Caribou Gallery spread fast creating talk and let’s hope sales last weekend. Nevertheless, a brand new gallery popping up in this area is a bold and cheeky move. The new Caribou Gallery opened it’s gold toned doors on June 21, 2012. It featured art by Denver painter and printmaker, Brian Comber and artist Murad Sayen, painter of narrative and atmospheric scenes. The gallery carries two jewelry artists, Cheryl Weber and Anita Gronstedt who brought original designs in gold and silver with colorful gemstones and beadwork leather bracelets. Shelly Metz, owner of the Caribou glowed with relief after months of hard work and preparation for the grand opening celebration on this night, June 21st – June 23rd. 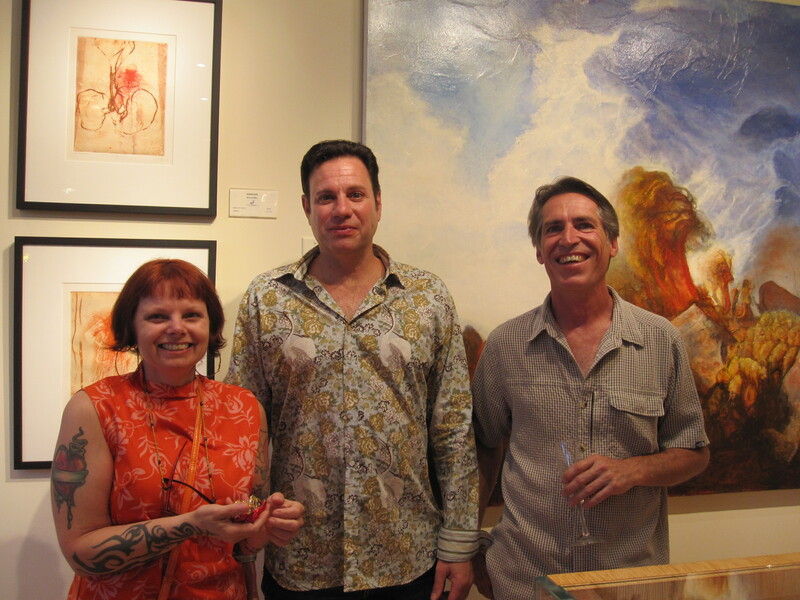 The lure of chocolate and champagne (and art) brought in long time art lovers and friends. It seemed people turned out to be there for the first, in a long time, new, woohoo, art gallery in CCN, which is exciting and interesting in itself. Long time art biz lady, Susan Freilicher (Southwest Art magazine for years & years) was instrumental in helping Metz fine tune the well laid-out gallery and mix of fine artists. Making it her job to welcome new galleries and artists, Candice Pulliam, Art Consultant non-pareil, blew in with local and fast becoming known artist, Tami Otis. Long time local artist John Crandall was there to support his good friend, Brian Comber. Wishing Shelly much luck with the Caribou. It’s a beautiful gallery. Show your support and head over there. You might want go before or after a delish bite at Cucina Colore (right next door). 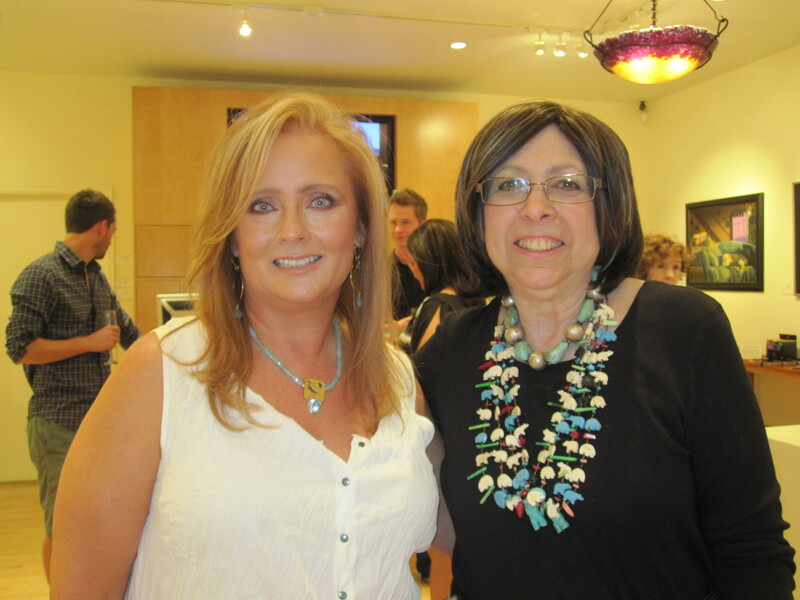 Shelly Metz, owner Caribou Gallery and Susan Freilicher, long time art promoter and friend. Below: Artists: Tami Otis, Brian Comber, John Crandall. Posting press releases for your summer calendar. At least now, you know what dates to go to Cherry Creek Arts Festival. DENVER, CO (June 19, 2012) – The Cherry Creek North Business Improvement District announced their 2012 summer event schedule. From old favorites such as Sidewalk Sale, to the introduction of an inaugural fashion show – Cherry Creek North will be buzzing with activities that are sure to please everyone’s palette. 22nd year hosting the Cherry Creek Arts Festival, which takes place throughout the streets of CCN July 6 – 8. This year marks the 42nd year of CCN’s Annual Sidewalk Sale. This longstanding tradition brings nearly one hundred CCN businesses out onto the sidewalks with unbelievable deals on merchandise, such as clothing, jewelry, accessories, art, home furnishings, and more. Don’t miss these sizzling hot summer deals July 19 – 22. The 4th Annual Cherry Creek North Food & Wine will take place the evening of August 11 on Fillmore Plaza and will feature twenty-four of our food & beverage establishments, as well as wines, spirits, and the brews of the 5280 Denver’s Magazine popular “6 Pack” promotion. The restaurant line-up this year spans multiple cuisines such as Indian, Japanese, Mexican, and Italian. Tickets are on sale now for $50 ($20 tax deductible), which includes unlimited food, beverages, and live music. On September 6, CCN will celebrate Fashion’s Night Out for the first time. The inaugural fashion event will start at 6pm with in- store shopping events until 8pm that are free to the public. At 7:30pm, festivities continue on Fillmore Plaza with a runway fashion show featuring fall and winter fashion trends from some of CCN’s clothing boutiques. The show is free and open to the public; however there will be a limited number of VIP seats available that will go on sale in July. A portion of proceeds will benefit Goodwill’s career development programs that help struggling individuals get outfitted for success. 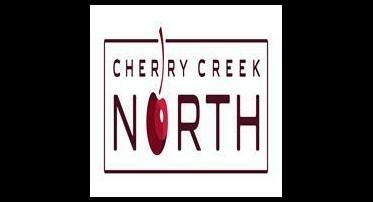 For further details regarding Cherry Creek North’s 2012 summer event calendar, visit CherryCreekNorth.com. Cherry Creek North is known nationally as an outdoor, premier retail, dining, and mixed-use area located just 5 minutes from downtown Denver. Our nearly 400 businesses that make up the District are independents to internationals (74% independent), featuring a broad range of unique fashion, jewelry and home furnishing stores, spas/salons, art galleries and restaurants. In addition to retail businesses, the District is also a national and regional office center, home to two hotels, and has a growing number of residents. In combination with the Cherry Creek Shopping Center, Cherry Creek North is the number one visitor destination in Colorado according to the Longwoods Study conducted for Visit Denver Inc. Cherry Creek North is a Business Improvement District (BID) and was established in 1989 as the first business improvement district in Colorado. The BID is a governmental special district chartered by State Statute. This has to be the perfect setting for the delightfully touching play, “Driving Miss Daisy.” Nothing in life is more important than friendship, love, humor and loyalty. Looking forward to this production at the…Barth Hotel. Classic serendipity arrives at this treasured landscape where, no doubt, the tv networks have missed a true reality opportunity. Hope to see this. I encourage lovers of theatre to get to the Barth. (Denver, Colorado) Alfred Uhry’s “Driving Miss Daisy” in the historic lobby of The Barth Hotel is the fifth annual summer theater fundraiser for Senior Housing Options (SHO), a non-profit providing quality affordable housing and services for 500 older adults in Colorado. Former Broadway actor Billie McBride plays the Southern Jewish widow Daisy, whose son (played by the Denver Center Theater Company’s Sam Gregory) insists she hire a driver (Dwayne Carrington– reprising the role for which he won a Colorado Community Theater Coalition best actor award in 2000), despite her rigorous complaints. Set in Atlanta from 1948 – 1973, “Driving Miss Daisy” is a profound comedy about aging, prejudice, family and unlikely friendships. Ashlee Temple directs. “Driving Miss Daisy” performs in the historic lobby of The Barth Hotel, 1514 Seventeenth Street in the heart of LoDo. (The Barth is one of Senior Housing Option’s 14 residences and home to 62 elderly and disabled adults.) The play opens July 26 and runs every Thursday, Friday and Saturday at 8:00pm through August 18. Tickets start at $25. For more information and to purchase tickets, visit www.seniorhousingoptions.org or call 303-595-4464. It was great meeting some of you at the Art Students League Summer Art Market on Sunday! I’m running TWO big shows this summer that offer fun and unique opportunities for artists! Both shows are INDOORS and allow you to rent a booth for the weekend and/or enter work into the open call gallery! The second annual Denver County Fair offers a quirky new take on the traditional county fair. Last year, we drew 25,000 attendees, and got LOADS of national press – including TWO articles in the New York Times! Denver County Fair is owned and operated by Tracy Weil and me – two movers and shakers in Denver’s art scene. We’ve got some big-name blue ribbon judges, and once again, Mark Penner-Howell is managing the Art Pavilion! 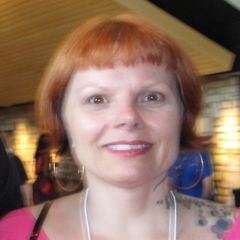 Kym Bloom, owner/manager of Kanon Collective on Santa Fe Drive, is our new Art Competition manager! Why? If you love Denver, love its artists, and believe Denver is becoming the new creative capital … you need to be here! The Art Pavilon team and the Fair management team are very respected in the local art community. We want to show EVERYONE how GREAT Denver’s Art Scene is! 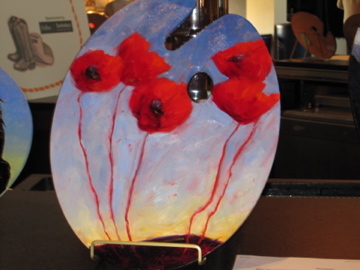 Plus you can win ribbons and cash prizes in over a dozen art competition categories! Each Blue Ribbon comes with a $50 cash prize – and we have lots of art categories! New: $1 of every competition entry fee goes to the Art Pavilion’s Charity Non-Profit Partner: VSA/Access Gallery. Rent a Booth in the Art Pavilion! 10 x 10 Booth: $350. Show and sell your work to our huge audience! Spaces are limited in this pavilion, and we expect a sell-out, so don’t delay! Enter pieces into our Open Gallery and compete for Blue Ribbons and cash prizes! Fee: $5 or 5 entries for $20. Space permitting, all qualifiying entries will be accepted! 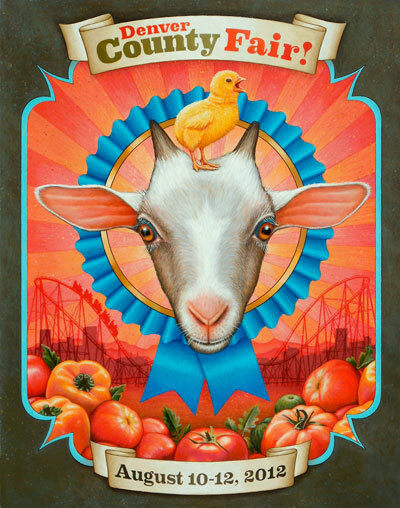 More info on the Denver County Fair Art Pavilion – including competition categories is here! The Denver Modernism Show has become an annual favorite, and one of the only indoor art festivals in town. Every year we draw more out-of-town buyers and this year, the Palm Springs contingency is bigger than ever! Artist SHAG ( Josh Agle) returns for 2012, as a special guest, guaranteeing that the number of art enthusiasts and collectors from around the country will increase! Denver Modernism Show Gallery juror: David B. Smith. In addition to bringing SHAG to the show for us again this year, David B. Smith is one of Denver’s leading gallery owners, committed to presenting intelligent and culturally relevant exhibitions featuring work from some of today’s most dynamic artists with growing international reputations. Locally, David brings a unique element to the Denver Art Scene. Through participation in leading art fairs and extensive media coverage, David has cultivated a strong regional, national and international collector audience. The New York Times hailed the gallery as offering “an exciting contrast of cutting edge works.” In addition to its curatorial program, David B. Smith maintains an active publishing division, whi ch produces limited edition artist prints and monographs. And not only that – He’s just a super nice guy! 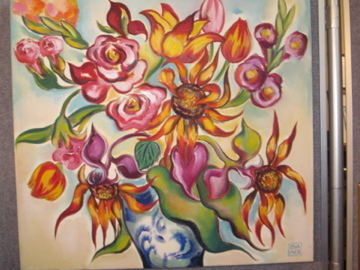 Visit the David B. Smith Gallery in Lodo, at 1543 Wazee Street. Rent a booth at the Denver Modernism Show! 10 x 10 booth: $250. Enter pieces into the juried Denver Modernism Gallery Fee: $10 per piece. More info for artists at the Denver Modernism Show is here! Aug. 14 – Deadline for submissions, midnight. Aug. 23 – Accepted artists deliver work to National Western Complex Expo Hall, 2-6 pm. Aug. 24 – Opening Night. Accepted Artist plus one guest admitted to Preview Party, 6-10pm. Aug. 26 – Closing Date: Artists must pick up work at National Western Complex Expo Hall, 4-7pm. I hope to see you at one – or both – of these fun events! * Who would like to be the first interview at DAM? 1. What inspires you these days? So much inspires me, like traveling, falling in love, films, music, creative sciences. These days I’ve been inspired by films by Jean Luc Godard, Chris Cunningham, Gaspard Noe and even just blips of beautiful scenes from a bunch of french new wave films. Over the summer I went traveling around Europe to be inspired by new art, artists like Hurvin Anderson, Alastair Mackinven, John Wynne. 2. Who are your heroes? 3. What is your idea of perfect happiness? Perfect happiness is the moment I step back from a painting to realize that its now a complete work of art. What once started out as an experiment, something I have not done previously, full of questions and the untrieds. It’s a very brief window of time where all my questions about the composition and meaning have been validated and magically worked out. It is such a calm and peaceful feeling when any ambiguity I may of have had has dissolved. To know exactly what your doing even while you’re still in motion with it. Unfortunately, that perfect moment is very brief, when the vision is clear and the concepts flows well together. It’s a moment I would like to revisit again and again. 4. What scares the hell out of you? The thought that all my work in life has amounted to nothing. 5. What makes you laugh hard? Being with my family. They are all such different characters and honest and brutal. Being around them is the only place I can lose myself in an uncontainable state of laughter. 6. Who are your favorite artists of all time? Alex Kanevsky, Jean Michel Basquiat, J.M.W Turner, Francis Bacon, Charlie Kaufman, Francois Truffoit, Michel Gondry, & Chris Cunningham. 7. What is your guiltiest pleasure? Standing ten feet back and throwing paint onto a perfectly good painting, ruining it just because I’m bored with the work. New “accidents” sometimes bring in new and exciting problems to solve which help me create a more interesting painting. I would like to have more patience. 9. What’s your favorite thing in the world? The feeling that life is so mysteriously great I could explode….it is the greatest feeling in the world. 10. What comes to mind when you think of Brooklyn? I just moved to Brooklyn, it is very new and I am happy to be living in it. When I think of Brooklyn, I think of many red bricks, the smell of pavement- it is growing. I think of beginnings of my family. I think of the new generation of artists and its diversity with a strong sense of community. There is so much to explore here, I don’t know where to begin. I want to discover its personality little by little as time goes on.